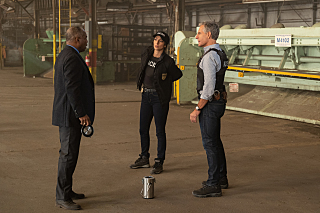 NCIS: New Orleans 5.13 - "X"
when the team discovers a rare and deadly virus was also stolen. it was a good episode including the whole team working together. at first I thought nero was one of the bad guys (didn't believe he was working for the health department for a minute) and when he and hanna bumped into each other I thought he had stolen something from her, didn't expect her to put a GPS tracker in his pocket. glad it turned out he was one of the good guys. maybe he shows up in a few more eps. he and wade going to have dinner together wasn't exactly what I had expected after their first encounter. hope they stay on the team thing now. Finally got around to watching this episode. It was pretty good. Liked how the team worked together. Gregorio and Sebastian were so snippy in this episode But yeah, Sebastian should not have been doing her laundry unless she asked him to! I knew that the CDC guy was the bad person once we saw him in the meeting. Agreed with what everyone else has said about the episode.